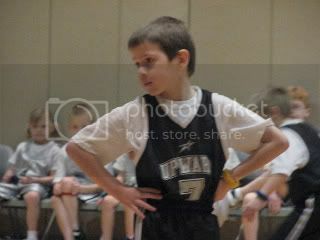 The boy's last Basketball game is this Saturday. When he started practice in December, he didn't know anything about basketball. Now he knows to stick with his man in defense. Unfortunately, he sticks with his man even when his team has the ball and he should be playing offense. This photo is not my son with 4 arms.... He is just doing a great job guarding his MAN! That's so encouraging that he didn't know anything to start with. My son (kindergarten) told me that he wants to play basketball, t-ball, and soccer. But he knows NOTHING about any of them. I'm thinking of signing him up through the Y. I hope we have as good of an experience our first time around as y'all have! A four armed boy? What's the doctor think about this? :-) Cute! What a cute little player! It is so fun to watch them grow into their sport, isn't it? We are going to be signing up our oldest for Upward Soccer in a few weeks and he knows NOTHING about it, so it encouraging how much your son has learned. 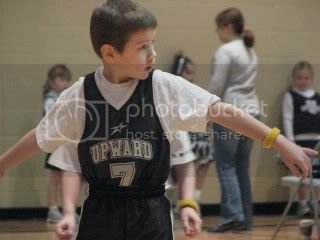 Do you like Upward? My husband coaches basketball. Needless to say our entire week is full of basketball. Your little guy is adorable. I think playing sports or just being involved gives them so much self confidence. I have to remember that...sometimes I'm just basketballed out. He's so cute! My brother is 10 and has been playing for 4 years, he loves it. I got my book in the mail! Thanks so much! Thanks for the book. When I'm done reading, I'll be donating it to my sons Eagle Scout Project. He's collecting books for a Low Income Senior Housing Apartment. They are including a library in the complex. Your son is a natural athlete. I loved checking out these photos. It looks like a fun time for your little guy!